Present to any audience, anywhere, with confidence. 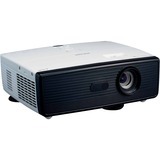 The RICOH PJ WX5150 offers a host of essential features - including bright, clear images, advanced connectivity and eco-friendly, cost-saving operation - to enrich presentations, training, teaching, seminars and more. As the latest addition to Ricoh's Managed Document Services (MDS) portfolio, this projection system can be integrated seamlessly with other business communication systems to streamline workflow and improve productivity. This powerful, easy-to-use projection system sets the standard for exceptional performance at an affordable price. Use it to bring your brightest ideas to life.